1,000 lb. scissor style drop tail lift with standard features including cycle jack, side extensions, adjustable wheel vise, stop and portable dolly. 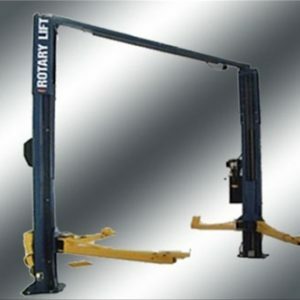 The lift has five locking positions and provides reversible side extensions to give you extra storage space for tools or more access to service ATV’s. The cycle jack gives you rear wheel service access and the front wheel stop and vise helps to secure from movement when lifting and servicing a cycle. The lift comes with an air operated foot pedal. Note – Forklift needed for unloading. Front wheel vise prevents wheel movement during securing, lifting and maintenance. 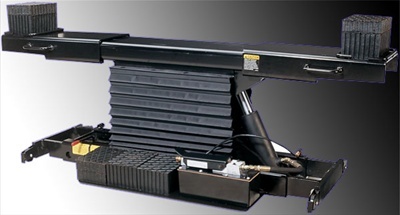 Foot pedal controlled power unit operates on 100 psi air. Rear section (drop tail) is removable for complete rear wheel access. 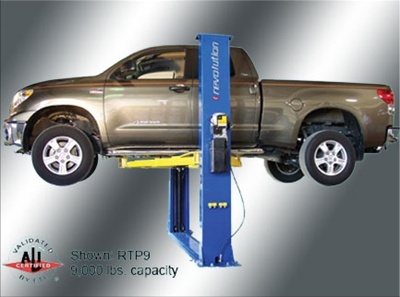 Side extensions are standard for ATV and additional vehicle service. 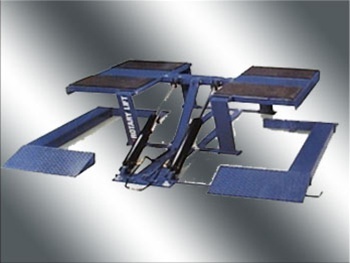 Specifications: RXLDT, Capacity 1,000 lbs., Rise 33”, Min. Height 7-1/4”, Length With Ramp 113”, Length Without Ramp 93”, Width Of Platform 24”, Width With ATV Adapters 48”, Air Requirements 90-100 PSI, Shipping Weight 690 lbs. 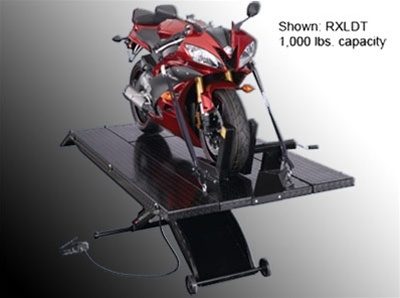 Be the first to review “Rotary Revolution RXLDT Motorcycle Lift” Click here to cancel reply.